Whilst many books about the effects of the First World War on local areas tend to focus on those who lost their lives, A Village at War manages to combine this with a complementary narrative about the effects of the war on the village itself. Adopting a chronological approach the narrative is anchored by extracts from the monthly parish magazine, supplemented by stories from the local paper and research from a wide variety of other sources. Details of the 32 men who lost their lives are well-researched and interesting in themselves, with detailed biographies and pictures of many of the men. A broad spectrum of ranks and units are represented, although unsurprisingly many of the locals joined either the East Surrey regiment or The Queen’s (Royal West Surrey) Regiment. Coupled with the additional information about how the war was perceived by those at home, the social composition of the village and the effects of the war on the local families are really brought to life. Life on the back at home was by no means easy, and through the parish magazine we see the initial patriotic calls for men to enlist turn into ongoing fundraising campaigns to send the men home comforts and more practical items, most notably sandbags. The birth of the women’s labour force and the debate that this caused is also seen through the eyes of the local people and their experiences. One also gets the sense of loss as the local casualties start to mount (including the son of the rector, the author of many of the patriotic ‘call to arms’ editorials featured in the parish magazine), and the impact this had on the individual families and the village as a whole. As the war drags on the justness of the cause is a common theme in the parish magazine, as are thinly veiled comments about those men not seen to be playing their part. Comprehensively illustrated with many pictures of the area and the people, A Village at War offers a window onto a microcosm of rural England during the war years. Meticulously researched over 25 years, it has obviously been a labour of love for the author and also benefits from the reminisces of some of the locals who lived in the area during this time. 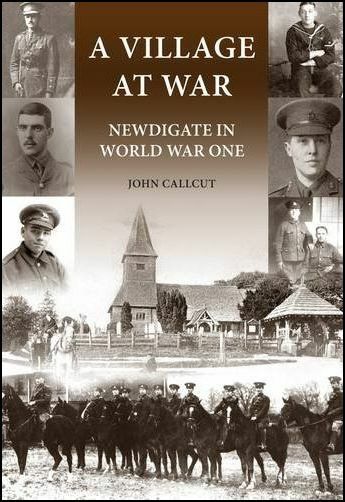 Required reading for anyone with an interest in Newdigate or who wants to know what the effect of the war was on a typical rural Surrey village.